Amazonite with a really nice flowing enrgy. 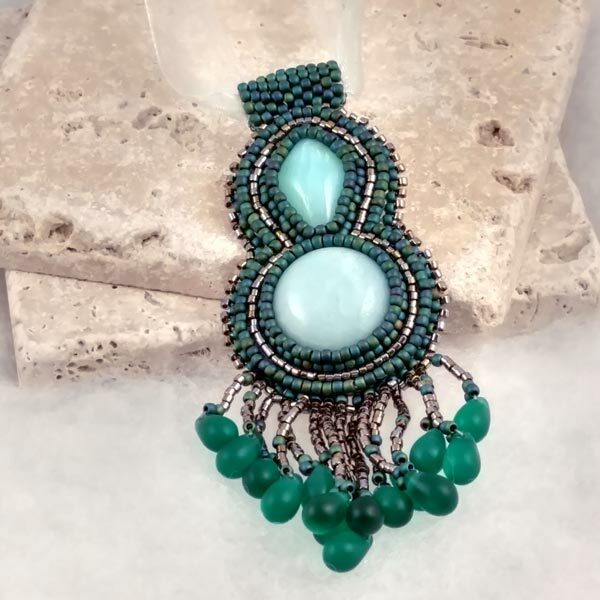 Beaded embroidery, entirely hand made and one of a kind. 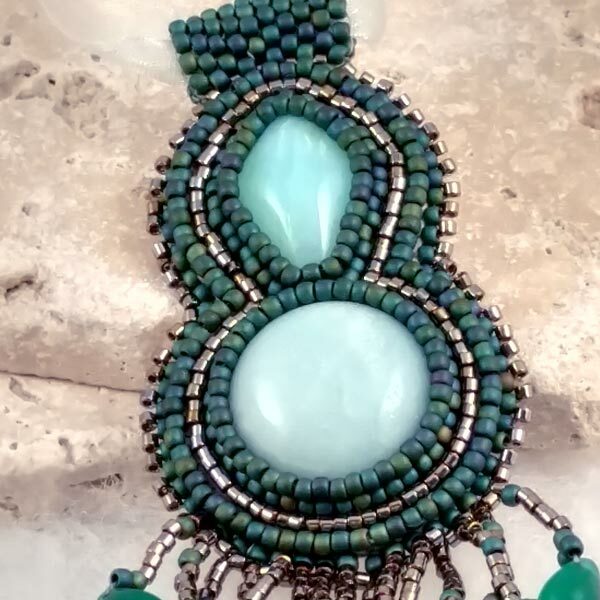 Amazonite pendant is 3-3/4 inches tall and 1-1/2 inches wide. Amazonite encourages self-determination and it lets us discard the idea of being a victim of fate and assists us in taking charge of our own life. Felt finished back, Swarofski tear drop beads and metallic glass beads. (13mm wide x 16 1/2' inches long, plus 2 inch extender chain). Aids the ability to release emotional grief by expressing it as creativity. Opens the connection between the throat emotional body and etheric body. Promotes the expansion of emotions in order to heal and resolve them. Aids in concentration and completion of projects. 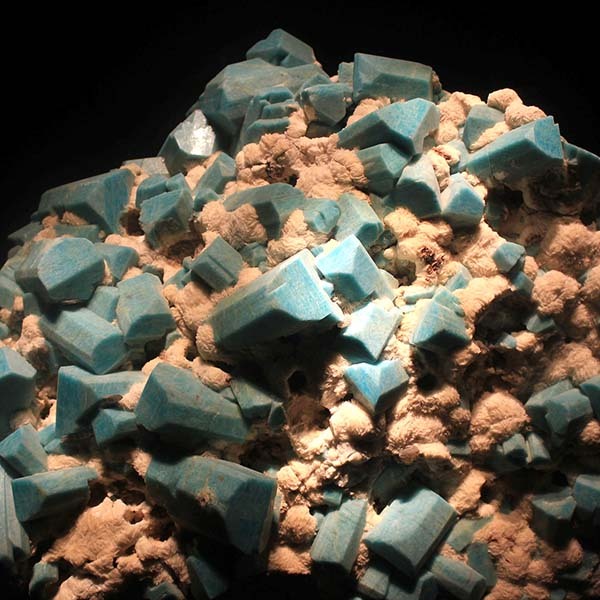 Amazonite has a triclinic crystal system and is in the mineral class of lattice silicate in the feldspar family. It's green coloring comes from the copper in its make-up. It can be formed from several processes. Hydrothermally, in sediments or metamorphically during the formation of crystalline slate. This stone can also be confused with Aventurine at times in its deeper shades because of the sparkles of microline in it. Generally though, Aventurine is much greener compared to this ones blue to aqua hues of green. Amazonite is best used by wearing or laying it on the body for long periods of time. Amazonite encourages self-determination. It lets us discard the idea of being a victim of fate and assists us in taking charge of our own life. Amazonite balances extremes of moods and has a calming effect. It will assist in removing feelings of apprehension and sadness and encourages a healthy trust in your God, Goddess or whatever you choose as your spiritual guide. Amazonite is a great help in problem solving. It encourages an interaction and connection between your rational thought and your intuition allowing for creative solutions. Amazonite regulates metabolic disturbances (liver) and also has a relaxing effect. It has also been helpful during childbirth in assisting the birth canal to expand naturally. It is a good harmonizer of the pituitary and thymus glands as well as the autonomic nervous system and inner organs. It can also help with heart complaints due to grief. Amazonite has an affinity with Virgo. Its Energy is Receptive, its Planet is Uranus, and its Element is Earth. It is a good stone for those involved in the arts. There are some stories that South American Indians said this stone came from a land of women without men and they called it the "Amazon Stone". It may have been confused with a nephrite that comes from the same region. It is found in Brazil, but also in Russia, and beautiful specimens can be found at Pike's Peak in the U.S. Some attribute luck in gambling to this one, the ability to attract money luck, and it is used by those taking chances to ensure success.